What Am I Blogging For? I'm faced with a question. What are you blogging for? I've recently embraced my love for nail art. Although I wear them as often as I can, I have to admit I was not always comfortable showcasing my nail art in public or more so, post them online. My hesitation sprung from society's stereotyping that girls wearing nail art, or even nail polish for that matter, are maarte. But I believe otherwise and I'm not afraid anymore to let people know that I'm a girl and I love nail art. 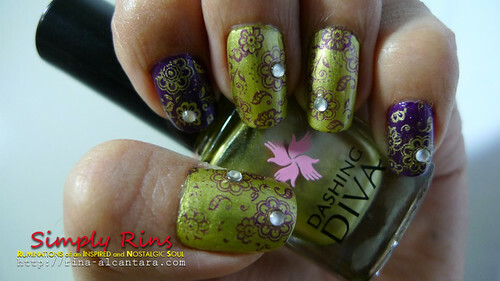 And so, the bulk of my personal blog is dedicated to my passion of painting my nails. But what's into nail art aside from the vanity side of it? I personally believe that painting my nails exhibits my individuality. It expresses my creativity, my thoughts, my mood swings, my emotions, my talent, and most importantly my personality. Doing nail art is an expression of self and I believe it shouldn't be hidden. Through my site, I'm hoping to change the way people think about nail polishes and nail art, and consequently, encourage them to embrace themselves and shout out who they are without hesitations or without having regard to what society thinks. Who says you can't color one nail different from them rest? Who says you can't color each nail with a different color? Who says rhinestones are just used in crafts? I've recently started collecting nail art accessories and have been designing my nails according to events or moods and posting them here at Simply Rins. Although my topics vary, every post in infused with a little of myself. I rarely see girls in our country that’s confident to wear nail art because society places a stereotype on it. Sometimes, I spot a few but are quite shy to show them. I’d like to change this view through my blog. Maybe if I can make my voice loud enough, people will eventually realize that it's perfectly okay to express themselves or to show what sets them apart from everyone else. Perhaps, not through nail art, but through their own skills and passion. 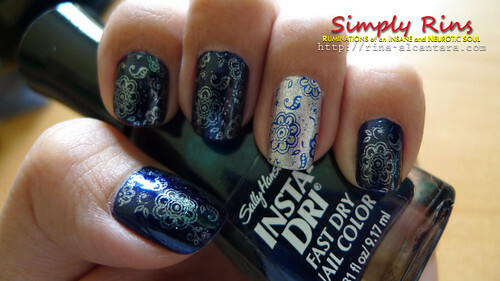 I loved loved your entry for the Daily Nail and I completely agree with you, individuality! Nail art is special and empowering! Hi again, AggiePigeon! I really did enjoy doing that challenge for Daily Nail. I'm so glad that there were people like you who supported my design. YES! Nail art is empowering! 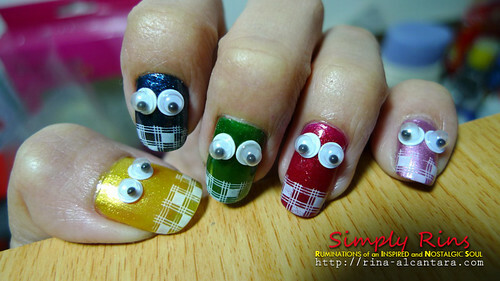 personally, I'm not maarte, ang I'm not very girly at all, but I'm totally into nail art. the flip side is that, I'm an art student so having nail art is not looked as maarte, more of creative, and some would comment like, I'm matiyaga and all and there are even guys in my class who would request designs for me to do next or to do on them even! That's good to know! :) I know a few guys who looks down on girls with nail polish, more so, nail art. One of them even said that nails with color doesn't look clean. Well, they are entitled to their own opinions. But as for me, nail art is self-expression and no, I don't have dirty nails. Rina what a great blog! i'll definitely be an avid follower!